The Gay Gamer: Are you ready to return to Silent Hill? Are you ready to return to Silent Hill? I don't know about you, but I thought the Silent Hill film was freaky beyond belief. Oh, sure, some of the writing and acting was horrible, but the special effects were great--and that's really all that really mattered. The guy who came out of the toilet (you know, he of the rapidly flickering tongue and a penchant for crawling around on his stomach) still gives me the creeps. Anyway, the fact that there have been four games (with more to come) and a movie based around the ghostly burg means the story has to have a sizable group of fans. 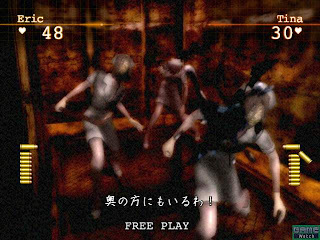 They're likely to be pleased with the news that Silent Hill: The Arcade is on its way to Japan and the U.S. If you ask me, this sounds like a perfect turn for the series, especially considering it's being released in the arcades. Not that I go to arcades anymore. Maybe it'll be released for the home systems (Wii!) eventually? I want to be a fishing master! Will Wii welcome previously Japan-only games? Square-Enix entering the "brain game" market? Rumor patrol: Okami coming to the Wii?